What better way to promote your upcoming DLC heist than with a four-minute dramatic retelling of said heist from the perspective of a seemingly innocent bystander. 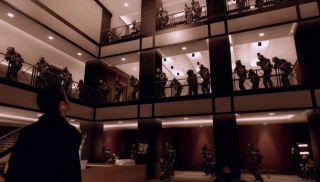 Well, for one thing, a four minute dramatic retelling of said heist from the perspective of one of its active participants, but Overkill are saving that for the game itself. Also, in this Payday 2—Big Bank trailer: opera. And bobbleheads. As I say, it's a very dramatic retelling. If you're in, near or within teleportation range of LA, Overkill have an E3 presence in the west hall entrance consumer area. You'll not need a ticket to get there, and they'll give you an early chance to tackle the Big Bank. Succeed, and you've the chance for prizes, including a Nvidia Titan graphics card. Be prepared to have your socks blown off by our exhaustive E3 coverage. See all the latest news and features right here .